From paddling with manatees to navigating through water set aglow by bright bioluminescent organisms, there’s no shortage of cool kayaking experiences to be had in Central Florida. 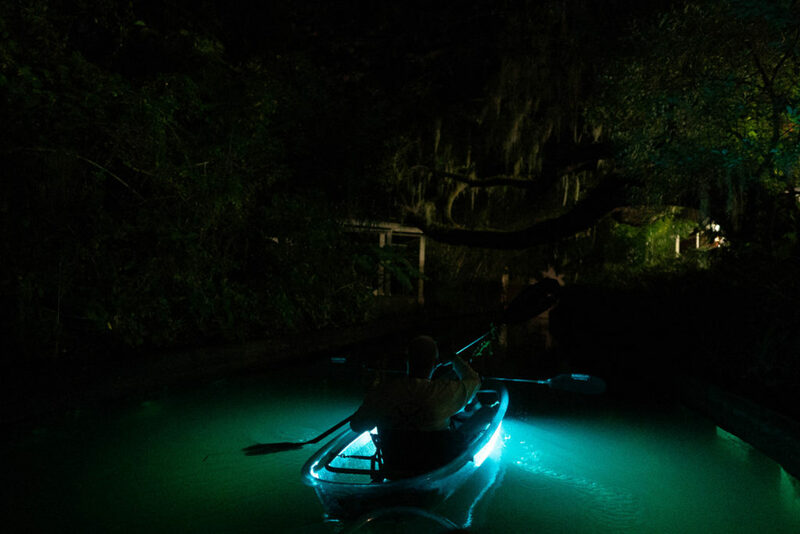 Now there’s one more incredible experience to add to your kayaking bucket list: glow in the dark kayaking tours in clear kayaks in Winter Park. Led by local clear kayaking company Get Up and Go Kayaking, each glow in the dark tour lasts about 2 hours. Your clear tandem kayak will be outfitted with LED lights to set the water aglow as you paddle. Change the color of the light to your heart’s content! Speaking of glowing water, fish are attracted to the LED lights on your kayak, so you may just spot some wildlife underneath you during your tour. As you navigate (in the dark!!) through stunning Venetian-style canals, you’ll emerge to visit three of the lakes part of a larger lake system known as the Winter Park Chain of Lakes. You’ll also cruise past gorgeous houses lining the lakes while learning about the area and its history. Tours are offered every Thursday-Sunday evening and cost $55/person plus tax and gratuity. Expect the experience to last for approximately 2 hours. Reservations are required; book online HERE. This new Winter Park glow in the dark tour is just one of many amazing tours Get Up and Go Kayaking offers. I can barely keep up with all of the cool new tours the company has launched since they got their start in 2016. All images and video courtesy of Get Up and Go Kayaking. Disclosure: Get Up and Go Kayaking is one of our valued advertising partners.